Lawyer burnout is not an uncommon trend, particularly among litigators who have pushed themselves beyond their limits. Attorneys regularly work stressful schedules often staying at work into the long hours of the evening. Many attorneys cope with their debilitating anxiety and depression by starting bad habits that can cause serious long term mental, emotional, and even physical harm. Despite the lengthy schedules, debilitating anxiety, and high rates of lawyer burnout, does attorney mental health necessarily have to be as bad as the preceding paragraphs imply? Fortunately not. 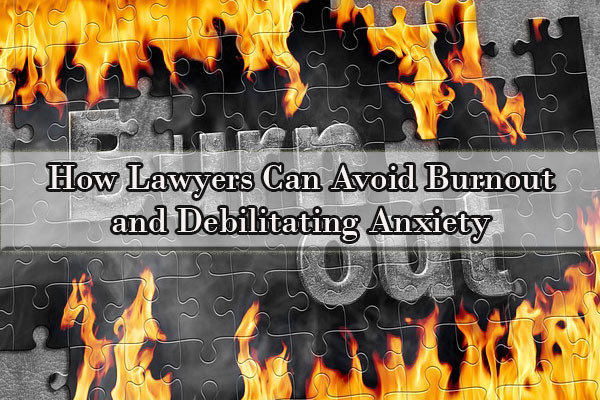 We want to share some tips how to avoid lawyer burnout, stress, and anxiety. Our attorneys may not be Buddhist gurus, but we have picked up a few tips, tricks, and life hacks along the way to make our daily schedules easier to handle. One partner who worked for a small criminal defense firm knew he had become burnt and discovered that he was depressed. His depression was caused by the stress he was under as a result of an excessive caseload and deadlines. The fact that a new file always landed on his desk the moment he walked in the door – despite his ever-growing pile of existing cases – made him want to avoid even going into work. This attorney began to examine his lifestyle and realized that he was working murderous hours to make the mortgage payments on his own home, a vacation home that he had used twice, expensive imported cars, and other miscellaneous big ticket sales items that did not improve his quality of life. In fact, he lacked any real leisure time to enjoy what he had. 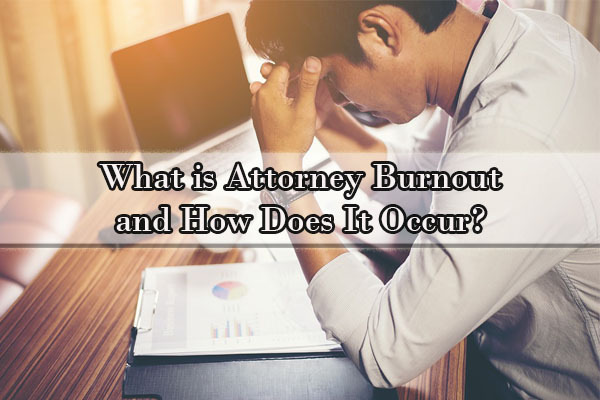 What is Attorney Burnout and How Does It Occur? Like many common stress-related ailments, burnout is not a diagnosable medical condition, but it does have distinctive psychological markers. The core symptoms of burnout include chronic fatigue, cynicism, a sense of inefficacy, and lack of attention. Burnout tends to arise slowly rather than suddenly and is considered by psychologists to be a chronic work-related ailment. When burnout occurs, it is frequently accompanied by increased stress, anxiety, and depression. Attorneys who are burnt out tend to feel as though they are seeing little forward movement in their day-to-day work life despite putting in large amounts of effort. 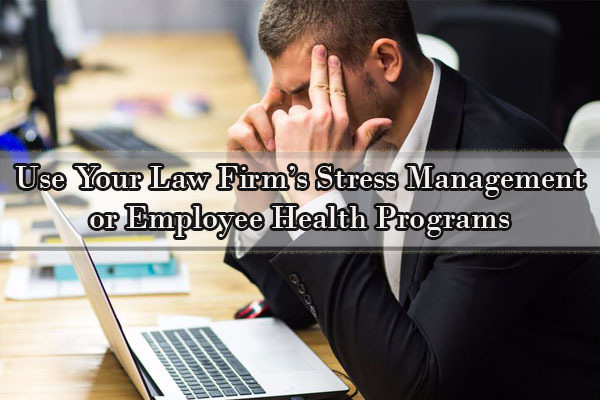 This can be the result of many different stressors in the workplace such as time pressures, large amounts of overloaded work, and competition among office members. 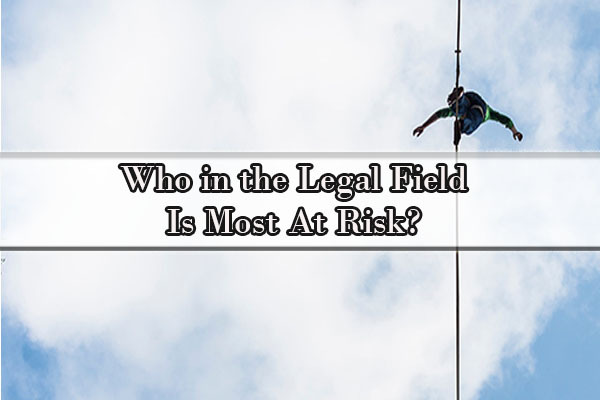 Who in the Legal Field Is Most At Risk? Across all types of law firms, associates are expected to meet certain billable hour thresholds (some firms have hard and enforceable billing requirements, but all others have implicit expected minimums) and even partners must constantly be thinking about bringing in and maintaining business. That said, two categories of attorney likely experience the worst levels of work-related stress, depression, and debilitating anxiety: litigators and solo practitioners. Litigation in particular tends to result in high levels of stress among attorneys. This is in large part attributable to the nature of litigation as compared to transactional work. The American system of justice is by its very nature adversarial with two opposing parties with opposite viewpoints. 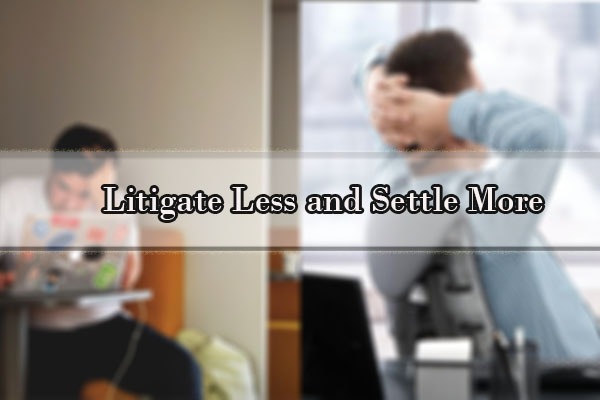 Litigation attorneys necessarily work with very difficult people for a living; people who will refuse to give an inch unless they are allowed to take a mile in return. Litigation attorneys must also be readily knowledgeable about different types of information from court and evidentiary rules to subject matter case law. Being asked a difficult question by a judge always results in a fair amount of momentary stress. Solo practitioners also can suffer from higher levels of lawyer burnout due to the demanding structure of their law practices. The average attorney must wear several different hats over the course of the day including client counselor, diligent researcher, advocate, and also friend/family member. Unlike most attorneys, however, solo practitioners must also wear several additional hats including the management, business developer, and marketing professional hats. Juggling all of these responsibilities can become very difficult and very stressful for solo practitioners, and newly minted solo practitioners in particular. Running a law firm is easier with help, and being the only attorney can be a lonely career choice even when accompanied by paralegals and office managers. Fortunately, there are many solutions to the problems addressed in this article. With careful thought and some time management, attorneys can generally overcome many of the problems that plague our profession. Lawyers seem to be believers of the adage that “what does not kill you makes you stronger.” Many believe, either consciously or subliminally, that they are functionally invincible since they have conquered multiple levels of education including law school. Unfortunately, the human body will beg to differ. Third-grade health science teaches us that humans need four things to live a healthy lifestyle: food, drink, sleep, and shelter. Most attorneys do not have a problem with the shelter component, but as a general rule, attorneys neglect their food and drink related needs and never get enough sleep. Ensuring that you get enough of your daily needs can be an important first step to creating a healthy lifestyle. Exercise is functionally required for health attorney living. As a profession, attorneys are sedentary individuals. The habit of sitting all day has plenty of negative side effects from increased weight gain to back problems. 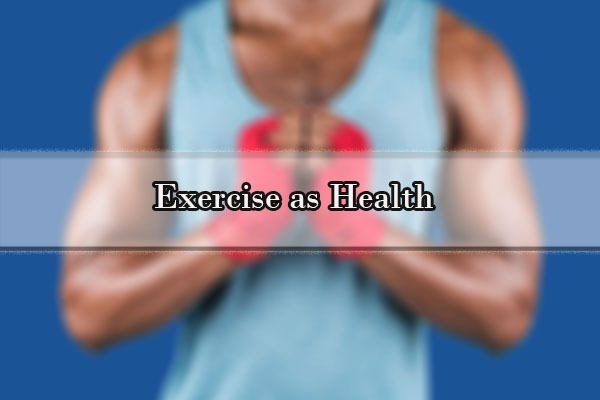 Exercise can cure these ailments in addition to relieving stress. Exercise also has one other benefit: it is guaranteed down time where no work can interrupt you. Working straight through the year without taking multiple sequential days off can create significant mental strain and feelings of being overworked. Even if you choose not to travel, a staycation can be a very valuable cure to work-related depression and anxiety. Attorneys should also consider taking an extended leave or sabbatical for at least six to eight weeks to give your mind and body a break. Obviously your financial situation needs to be weighed against the cost of your mental health. As a general rule, no attorney (except for those pushing for 3,000 billable hour years) should be working away their lives. For attorneys striving to bill 2,000 hours, that goal can be reached by simply billing five and a half hours every day of the year. Obviously, not everyone works every day of the year, however, and most people, even attorneys, would like days off. A little over 2,000 billable hours can be reached by billing 38.5 billable hours every week. Obviously, not every hour worked is billable, but in general, attorneys should be striving to manage their time well. On average, attorneys should probably not put more than 45 total hours of work into any given week. After working five 300 hour months in a row on a case that had just concluded after a jury trial, an experienced medical malpractice plaintiff’s litigator with a well-known firm approached her supervising partner for help. The partner simply told her to work harder to manage her caseload of expert depositions and court appearances. She realized she was in trouble when she spent a day in the office so stressed out about filing an appellate brief in time for the deadline that she could not think straight at all. In the end, she was forced to take a draft of her appellate brief with her to edit on a three-day pre-planned vacation. She was always tired before arriving at the office and would always leave feeling sick to her stomach. To prevent any further downward spiral, she left her law firm for six months on an extended sabbatical to reconsider her career plan and re-evaluate her life. It was not that she disliked being a lawyer – in fact she loved her job at heart, but not what her job was making her do. She realized that another full-time position working 60 to 80 hours per week was untenable, especially with the pressure of injury cases worth hundreds of thousands of dollars riding on her shoulders. She ultimately decided to take a part-time work as a project lawyer at a firm where 45 hour weeks (not billable hours, total hours) were considered full time. She was amazed and threw herself back into work, a healthier and happier attorney. She is now enjoying her work and relishing her home life. Separating work and home is statistically shown to improve mental health. Maintaining that balance is important not just to your own mental health, but also to cultivate strong relationships between you and your friends and family. If you must take work home, give yourself a limited number of days per year that you will allow yourself to bring work with you. In all areas of law, some clients will always be painful to work with on a regular basis. If you have a bad experience with a client, you should not be afraid to refuse future work from them, even if it means that the client must find another attorney. We are not suggesting that you change career paths, as there are plenty of areas of law to keep you interested and engaged. Established lawyers should focus on taking cases that they want to take rather than taking everything that comes in the door. For example, if you do not like taking workers’ compensation cases, turn them away and advertise more for other types of work. Four months after returning from her three-week maternity leave, her firm cut her loose. One week after leaving the firm, she began making plans to open her own practice. It was initially hard for her financially, but her practice eventually bore fruit. She knew when she had finally found success when she began litigating a case against one of the senior partners at her former law firm. When the jury returned a verdict in favor of her client, she wanted to jump for joy, but maintained her cool, simply shaking the opposing lawyer’s hand before leaving the courtroom. As explained above, litigation can be an immensely stressful form of law practice, but in the modern legal world, not every case must go to court. In fact, statistically, over 90% of civil cases settle before going to trial. Early resolution through mediation and arbitration can save both you and your clients significant stress and time. If simply adjusting your schedule is not working, it may be best to switch career formats. Distinct from switching careers, changing the format of your career simply allows you to use your skills in a different way. Becoming an independent contractor or a consultant will free up more time for you to spend with your family and friends, and often comes with a similar paycheck. Many attorneys will be unable to find the perfect work life balance and relieve stress all on their own. That is okay and is not a failing. You should feel comfortable liberally consulting health professionals who can provide personalized programs for stress relief (e.g., osteopathy/chiropractic therapy, therapeutic massage, biofeedback). An employment law specialist realized she had become burnt out after a needless altercation with a younger associate. In a meeting where the associate attorney admitted to a minor mistake, the employment law specialist just lost it. Her colleagues had previously warned her that she had better start taking things easier. Her doctor described her as at risk for a nervous breakdown or heart attack. Her immediate response was to double down because there was too much work to do. If it all got done quicker, she would have more personal time. It didn’t work. Eventually, she recognized a chronic pattern of denial after re-evaluating her behavior. She had been struggling to be a lawyer, wife, mother, and daughter to her elderly parents, and simply internalized the stress to cope. Her ineffective coping mechanisms resulted in chronic headaches and exhaustion. She decided to leave the practice of law permanently and reports that her headaches have disappeared. Many law firms provide their employees with in-house employee wellness initiatives and programs. At large firms, these programs can be expansive including personal trainers and in-house gyms. At smaller firms, access to external physical and mental health resources is becoming more and more common. If your law firm does not have such a program, you can likely find one to enroll in at your local gym. Law firm partners, office managers, and solo practitioners should learn to delegate (or hire staff to take on) important managerial tasks. While many people find running a business to be fulfilling, many law partners dislike that part of their jobs. Finding someone you trust to work on those managerial tasks you dislike can save hours of stress. All state bar associations provide lawyer health assistance programs. Bar mental health programs are available to assist attorneys with all types of common physical, mental, and emotional stressors. Counseling is available for behavioral health and substance abuse problems. Help is often available for law practice management issues as well. Surprisingly, the average American worker spends only about half of his or her day doing actual work. Most of the rest of the time people are at the office is spent in conversation, on cell phones, or on the internet. With so much time lost, many find it effective to schedule times when they plan to work on specific tasks. 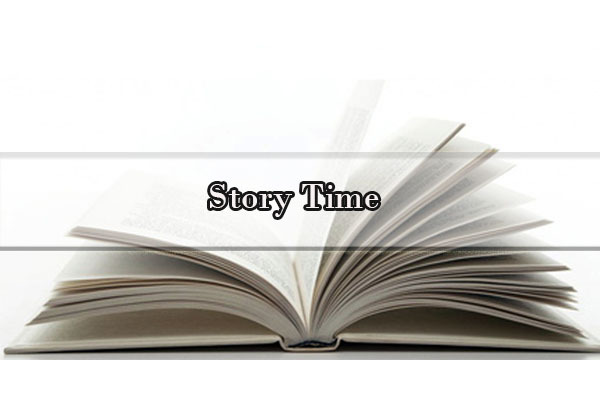 If you know you must begin work on a particular file by 2p.m., you will know when to get straight to work. In conclusion, attorneys are a stressed and anxious profession with high rates of burnout, and you should not feel ashamed for needing assistance. When you are more aware of the possibility of depression and can recognize it in advance, you have already started down the path to successfully becoming a healthier attorney. You can use one of the aforementioned techniques or implement ideas of your own. The most important thing is to stay healthy and be ready to take action when it becomes necessary. We need to remember that we are human beings who need rest from time to time. The Law Offices of Yuriy Moshes is a full-service personal injury, employment law, and real estate law firm practicing in the New York City area and in New Jersey. 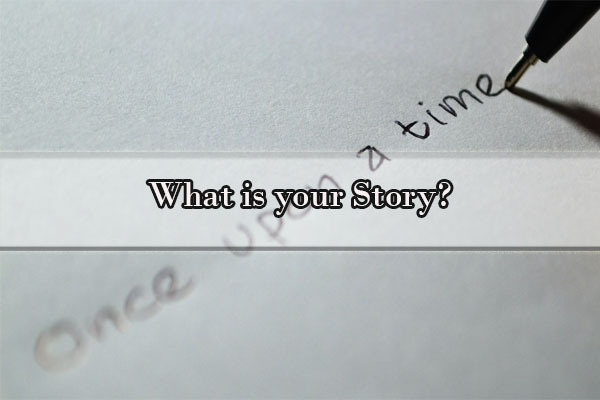 If you have any additional questions or would like to share your own stories about attorney depression and anxiety, we will be happy to take your call.